The People’s Summit in Chicago brought together 3,000 people to discuss the future of Bernie’s political revolution. Despite lively informal debate, the urgently needed strategy debate on how to continue the political revolution was disappointingly limited. 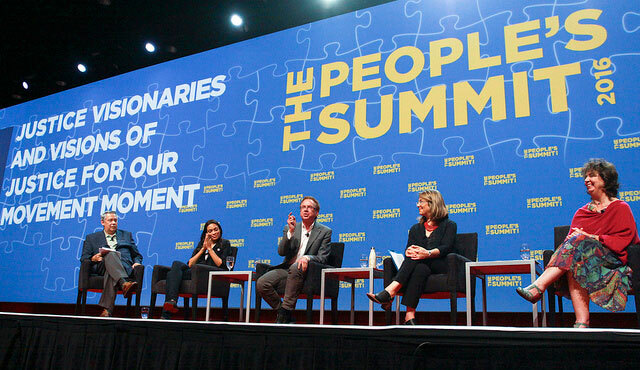 Mainly organized by the combative and left-wing National Nurses United (NNU), and politically dominated by the social democratic Democratic Socialists of America (DSA), the “People’s Summit” brought 3,000 participants together in Chicago to discuss the future of the political revolution Bernie Sanders had called for. Amongst others, It was backed by 350.org, Physicians for a National Health Program, and the People for Bernie. Through the three days of speeches, discussions, and workshops the will of the participants was visible: to use the momentum of Sanders’ campaign to build movements and push back the agenda of big business. Supporters of the political revolution were searching for a way to continue this inspiring uprising against corporate cash, corporate media, and corporate politicians. Despite the defeat within the Democratic Party’s primaries, people from all over the U.S. gathered in Chicago with a positive spirit. Encouraged by the successes, instead of feeling defeated, the primaries challenged them to get more active. One of the most shared tweets about the #PplSummit was from Jill Stein, Green Party presidential candidate, explaining her disappointment at not being invited, despite asking for a chance to speak. As soon as Bernie Sanders drops out, Stein is expected be the strongest left voice within this election cycle against the corporate mainstream candidate, Hillary Clinton, and the pseudo anti-establishment billionaire, Donald Trump. Elections Don’t Matter, So Vote Clinton? There were not many speakers who openly argued to support Hillary Clinton. Frances Fox Piven, the longstanding activist and DSA representative was one of the few. She called on people to vote for Clinton to stop Trump. Most speakers were not so explicit, they just hinted their support for Hillary without creating space for an open discussion. While this sounds radical, on this occasion it was not linked to any movement-building strategy towards the presidential election. And, as Jill Stein was not included, Klein and other speakers, in practice, called for an end of the political ambitions of the movement around Sanders and ordered it to return to its movement building tasks. That part is absolutely needed, but the power of Sanders’ campaign was to bring movements together in a political challenge to the corporate establishment. Why did Sanders not succeed? What conclusions should we draw from his campaign? No answers were given. John Nichols, writer for The Nation, argued that “we never lose, we always win, because we always rise.” He claimed to specialize in losing campaigns – from Jesse Jackson till today. But somehow losing didn’t matter. He seized on the example of Eugene Debs: “Eugene Victor Debs ran for president in the USA in 1900, 1904, 1908, 1912, 1916 – and the history books tell us that he never won. … [However,] if you look at what Eugene Victor Debs preached in his losing campaigns, [social security and more,]” Nichols argued that steps toward them would later be implemented by the Roosevelt administration. He did not mention the uprising of the U.S. working class in the 1930s and its search for self-organization at that time. Rosario Dawson, actor and activist, argued for “patience.” If this is losing, it doesn’t feel like it, Dawson expressed. DeMoro pointed out that Sanders’ campaign fell short because of “massive corruption in the machinery of the Democratic Party … [and] manipulation by the press.” However, no conclusions were drawn from this experience. At least, as DeMoro highlighted, Sanders is not planning to hand over his mailing list to the Democratic Party and with that, hinted that there might be independent moves in the future. In a very well attended workshop Kshama Sawant, Seattle’s socialist council member, spoke alongside Frances Fox Piven and Bhaskar Sunkara, editor and publisher of Jacobin, about “Democratic Socialism in a New Time.” The first question was about socialism. As it was the most looked up word on Merriam-Webster in 2015, what is it? Kshama outlined a different society based on economic, racial, and gender justice, a society where the power of the big corporations internationally is broken and they are taken over into democratic, public ownership. Piven came in, stating that she is a proud member of DSA, but is not sure whether she is a socialist. She was unclear what socialism is, “Mussolini was a socialist, the Chinese Communist Party – are they capitalist?” she asked. She decllined to give a definition of socialism, and warned about the hope for a “sweeping revolutionary change,” but wanted to fight one battle after another. The term “political revolution [makes me] shiver,” she said. Instead of a definition of socialism, Sunkara shared some autobiographical insights. He spoke about his social democratic upbringing and his reading of Marx. The socialist movement should “not neglect the day to day struggles” and at the same time not lose sight that changes need to get achieved by struggle. Being a socialist, according to Bhaskar, means to raise class consciousness. That’s where he left it. As Kshama called the Democratic Party the “second most anti-socialist party after the Republicans,” the chair of the workshop took it on himself to argue against her and tried to limit the discussion to the question: “socialist policies on a community level.” Kshama outlined the successful combination of building movements and a truly working-class representative in a council which helped win a minimum wage of $15 in Seattle, and pushed discussion to the left on affordable housing and rent control, and more. But she unbendingly insisted again, that the success in Seattle shows that a new party is needed. Inside the Wall Street owned Democrats this will not be done, she emphasized, with huge support in the room and to the displeasure of the chair. Among the other main speakers there was a variety of political trends: on the one side Congresswoman Tulsi Gabbard stood out by warning against a military intervention in Syria. On the other side, to hear Jesus “Chuy” Garcia, a decade long representative of the Democrats in Chicago’s Cook County – a cesspool of corruption – speaking in agitational sound bites against the Democratic Party’s “machine” was more than a little bit ironic. While many participants used the summit to have informal discussions, a lively exchange, and enjoy a rich cultural program, the opportunity for a real discussion about the way forward was unfortunately mainly lost. Supporters of the political revolution need to look to alternative ways to develop their strategy beyond the Democratic Party National Convention in July.